For the 1978 model year, the Malibu name, which had been the bestselling badge in the lineup, replaced the Chevelle name. The new, more efficient platform was over a foot shorter and had a lot of weight compared to previous versions, yet offered increased trunk space, leg room, and head room. Only two trim levels were offered - Malibu and Malibu Classic. The Malibu Classic Landau series had a two-tone paint job on the upper and lower body sections, and a vinyl top. Three bodystyles were produced (station wagon, sedan, and coupe), and the design was also used as the basis for the El Camino pickup truck with its own chassis. The sedan initially had a conservative six-window notchback roofline. This was in contrast to the unusual fastback rooflines adopted by Oldsmobile and Buick divisions which would later revert a more formal pillar style. To reduce cost, the windows in the rear doors of four-door sedans were fixed, while the wagons had small moveable vents. No doubt this design contributed to the number of factory air conditioning units sold with the cars, to the benefit of General Motors and Chevrolet dealers. For the 1981 model year, sedans adopted a four-window profile and “formal” pillared upright roofline. The two-door coupe was last produced in this year, as the Monte Carlo assumed the market position held by the 2-door coupe. Iraqi taxi: In 1981, General Motors of Canada produced a special order of 25,500 four-door Malibu sedans for Saddam Hussein’s Iraqi government. The deal was reportedly worth well over $100 million to GMCL. These special-order Malibus carried the unusual combination of GM’s lowest-power carburated V6, mated to three-speed transmission with a unique on-the-floor stick shifter. However, only 13,000 units ever made it to Iraq, with the majority of the cars becoming taxis in Baghdad With the remaining balance of about 12,500 additional Malibus either sitting on a dock in Halifax or awaiting port shipment in Oshawa. In the end, the orphaned “Iraqi Taxi” Malibus were all sold to the Canadian public at the greatly reduced price of about C$6,800. 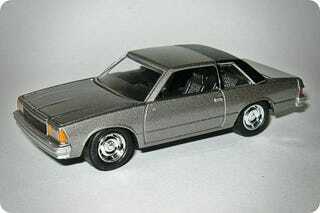 The Malibus are by Johnny Lightning, the El Camino is a Hot Wheels model.